It’s big. It looks cool. It makes me want to be an artist instead of a wordsmith. I’m talking about the Dell Canvas which practically begs you to design something awesome. “For the uninitiated, the Dell Canvas 27 is essentially a big, 27-inch LCD display that the more artistic among us can use in content creation,” Slashgear said. Similar to how we listen to customer reviews and work with industry experts to inform our design, we also talked with real-world users to develop Canvas. 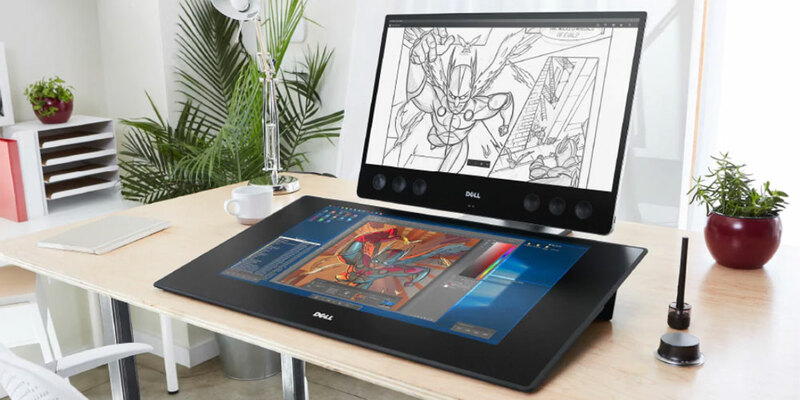 “The Canvas itself is a 2560×1440 display with purposefully huge bezels that Dell implemented after artists told the company that they preferred having a place to rest their palms while drawing,” ExtremeTech noted. If you’re one of those content creators who has already added what PC Magazine called a “cool, natural evolution of the artist’s workspace” to your own setup, a team of creators inside Dell has a new series of videos to help you get it set up. Through Windows 10, Canvas is paired with your existing PC and monitor, so the videos include helpful tips for your display settings — such as how you should extend your desktop rather than duplicate it. Those are just a sample of the many videos you’ll find in our Canvas playlist on YouTube. Want a third-party opinion on Dell Canvas? Check out the series of videos freelance illustrator and concept artist Lawrence Mann has put together on his LAWRENCEcanDRAW channel on YouTube.